Can I pass you the what? I have to what with this thing-a-ma-jig? Not a week goes by when I don't look at my chef with a perplexed and dazed expression and ask "what did you just say"? 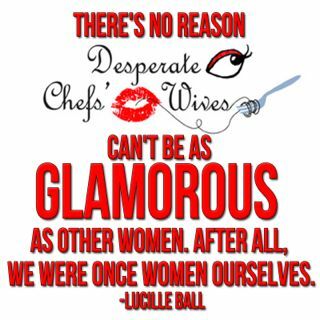 I may have married a chef but that certainly does not make me one by proxy. 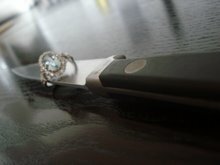 I am still clueless, even after years together. Don't get me wrong though, I have learned some tricks. I have a best friend who shares her knowledge freely, her name is "Google". And then there is the bible, LaRousse Gastronomique. This giant encyclopedia contains words that even the chef doesn't know. It also comes in handy when you can't figure out how to spell the word for a google search. Bain Marie = A water bath for keeping cooked food or dishes warm or without allowing them to continue cooking. OR fancy term for a metal container. Mirepoix = a culinary preparation of diced vegetables. Uh, OR you could just call it a mixture of carrot, onion and celery. Roux = a cooked mixture of equal amounts of flour and butter used to thicken sauces. I like to think of it as the awesome mix that makes awesome mixes more awesome. What words stumped you? Which ones would you share? 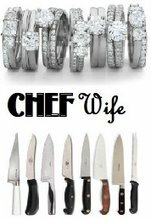 Let's start the chef wife dictionary! Bain Marie, also used when cooking something that cannot be cooked directly on the stove. Its a pot of simmering (not boiling) water with a heat safe bowl over it with the product (when I use it, its usually chocolate or a mousse). Just another use for it. I am in culinary school so I understand a bit more. Ah yes, love it when my chef speaks culinary to me:) Like, a la minute-cooked to order and beurre blanc-white wine butter sauce. reduce- I actually have no idea HOW to reduce a sauce but I'm pretty sure it has something to do with making it thicker..?? I guess I haven't been paying attention as closely as I used to. Oh My God... I just can't stop laughing. You ARE all so right. I'm writing to you from Buenos Aires, Argentina (that's South America). Hubby is an Argentine chef, who uses a great deal of slang along with A LOT of French words. So when he's talking business.. it's hard for me to follow. I'm an English-Spanish Translator, so whenever he asks me to do just that.. translate... I bump into a huge obstacle: the ample use of French in his vocabulary. But it's all part of our everyday life.